Furnish the skills of fresher/Experienced at corporate by delivering industry admirable certification for Data Analytics training. Placement assistance would be 100% after completion of 70% of Data Analytics training our dedicated placement team arrange interview till placement. Data Analytics refers to the process of examining information and data sets to derive conclusions which can be used for better decision making of the business. It is also considered as a quantitative and qualitative and process which is used by the business organizations to increase their productivity and achieve business gain. In today’s highly advanced world, with increasing amount of data, it is become useful for the company to inspect, clean, transform and model information in order to find something more useful data which can support decision making. With the help of Data Analytics, the business cannot achieve growth by following the complete Data Analytics process which includes business understanding, Data Exploration, Data Preparation, Data Modelling and Data Evaluation along with deployment. Today, major decisions taken by the businesses is by utilizing the insights derived from the information related to the industry and the organization. With increasing competition, it has now become necessary for the companies to identify the requirement of the customers and fulfill them with accuracy. For this, Data Analytics needs to be performed at every level for which a professional Data Analyst need to be hired. There is a huge scope for Data Analytics in the Indian and international market and if anyone wants to enter into the Data Analytics field, then the individual should consider attending Data Analytics Training in Gurgaon provided by SLA Consultants Gurgaon. 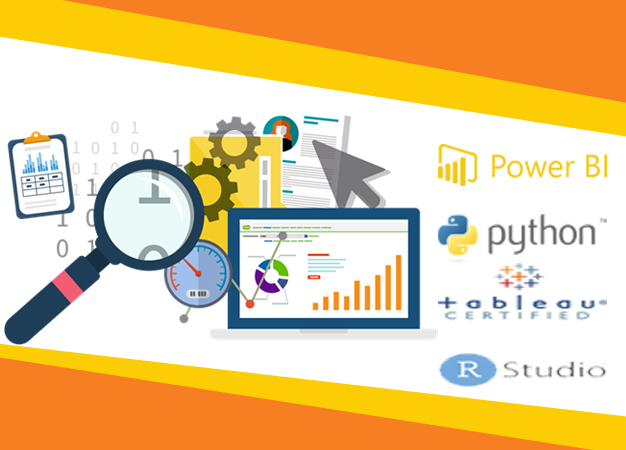 The Data Analytics Training will impart extensive and job oriented knowledge in various Data Analytics Tools and techniques to the participant which include SAS, Excel but, VBA and Macros, SQL and MS Access, Tableau or MS Power BI, and R-programming or Python. The Data Analysis course content of the Data Analytics Training Gurgaon/Gurugram is designed to meet the current industry requirements so that it provides the students with job oriented and industry specific expertise in Data Analysis techniques and tools, allowing them to become an in demand professional easily. The Data Analyst Course is specifically targeted towards college graduates and current working professionals who want to master Data Analytics in order to improve their career. The eligibility criteria to join the Data Analytics Courses to have a graduate degree in any field. The Data Anlyst Training is divided into five different modules which can be completed within 150 hours of Data Analytics course duration. The Data Analytics Training Gurgaon/Gurugram offers in depth and hands on experience in Data Analysis techniques to the applicant using Real-time Data Analytics Practical Training executed by highly certified subject matter expert with over 10 years of experience in the Data Analytics field. The participants are required to work on various live projects and assignments that would enhance their working knowledge of Data Analytics tools such as SAS, R-Programming and Python, VBA and Macros, MS Excel, SQL and Access, etc. With the help of Real-time exposure on working with clients, the participants gain relevant Data Analytics skills such as creative and analytical mind, mathematical ability, problem solving skills, programming knowledge in SQL and Python, Analysing, Modelling and Interpreting Data, Logical and Methodical approach, attention to detail, etc. The major highlights of the Data Analytics Training Gurgaon/Gurugram include instructor LED classrooms, practical concept with handouts and workshops along with weekdays/weekends Data Analytics classes. Our administration offers tremendous support to the students during the Data Analyst Training to help them successfully acquire job specific knowledge in Data Analytics. Upon completion of the Data Analytics Training all the participants are able to perform the job responsibilities of a professional Data Analyst which include collecting relevant information from primary and secondary sources and maintaining database, working with the management team in order to privatise the requirements of the Business Analysing and interpretation information and develop reports, converting raw data and represent it into a meaningful manner which can be used for decision making, identifying trends and patterns of Data Sets, filtering and cleaning confirmation to identify issues and resolve them and much more. The Data Analytics Training Gurgaon is highly beneficial for candidates who want to become a professional Data Analyst, Data Manager, data scientist, Senior Analyst, Business Intelligence professional and other IT professional. After 70% completion of the Data Analytics Training, 100% Job Placement Support are offered to the students which include conducting mock interviews and providing them personality development training so that they become ready for facing any interview at MNCs. And with valid certification in Data Analytics that will be awarded to the participants, they will gain competitive edge over other candidates during the interview and result in resume building which would certainly impress the recruiters. After acquiring skills in Data Analytics tools, you will become a highly valuable professional in the market who will enjoy better job security and job growth opportunities in the future. Due to the continuous generation of Big Data, there is an increased requirement for professional Data Analysts in the market which is expected to increase by 300% in the next couple of years. And hence, you can easily land into a promising job at any reputed agency as a Data Analyst. Data Analyst and Data Scientist are one of the most significant job profile in the current business market which offers great respect and recognition in the industry. Apart from that, you will also receive better pay scale as compared to other professionals in the industry as the average pay scale for a date and list in India is around 500000 per annum as of 2018. This is expected to increase more in the next few years. After acquiring skills in Data Analytics, you will not only be eligible to work in technical industries but also you can pursue a career in telecommunication industry, healthcare industry, real estate industry, e-Commerce industry, education industry and many more. With all these remarkable benefits associated with learning Data Analytics, no wonder more and more fresher graduates are pursuing Best Certification Training in Data Analytics in Gurgaon in order to lead a promising career ahead. You can also do this by attending SLA consultants Gurgaon for the Best Data Analytics Training Course. For more information regarding the Data Analysis course or the Data Analyst Training Institute, you can give us a call or visit our office in Gurgaon. Find the Data Analytics course details below. In which industries Data Analytics have much importance? Data Analytics is the need of the hour and have remarkable presence in various Industries such as Banking and Finance, retail, IT, pharmaceutical, healthcare, media, sports, real estate and much more. Data Analytics is considered one of the fastest growing industries in India which have been a drastic increase of 80% in the last few years. There will be a constant demand for data lists in the coming years in India. What are the job profiles I can pursue after completing the Data Analytics training? You can become a Business Analyst, Data Analyst, Project Manager, Senior Analyst, Data Scientist, etc after acquiring skills in Data Analytics. Do I need to have programming skills in order to attend the Data Analytics training in Gurgaon? No, all it requires is to have a graduate degree in any field to attend the Data Analytics training, however, haven’t some programming language can be beneficial for the course. If you miss any class or fall behind, our administration can arrange you a backup class which will be subject to the availability of the trainer. I am a working professional and cannot attend weekdays classes. Are weekend classes available? Yes, SLA provide both weekdays and weekends classes for the participants as per their preference.